Blue Skies was Foggy Mist's fourth foal. 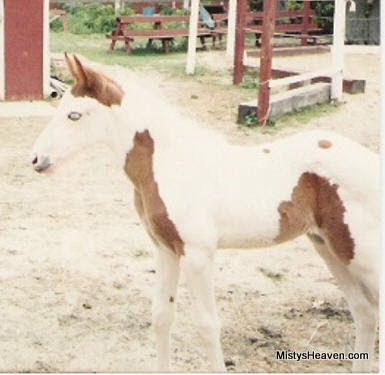 He was the first known medicine hat pinto in the Misty line. Blue Skies had blue eyes which gave him his name. He was born on the Pony Farm that summer when Celina Boltinghouse worked there, however the following year, he was no longer at the farm. A co-worker of Celina's said that he died, however there had been a deposit put down on him so he might have gone to his new home.